Last night I attended the Whodunit? Gala Preview and Auction at the Ontario College of Art & Design (OCAD). 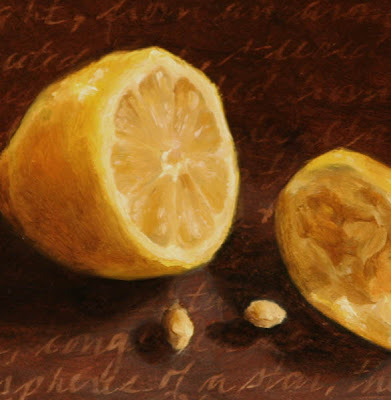 For me, a flâneur at heart, it was a perfect opportunity to infiltrate the well-dressed crowd and to watch, entirely incognito, as people braved the crush to scrawl down their bids for the small works--my still life lemon painting (above)--was one of them. None of the artists' names was revealed, so unless people were already familiar with a particular artist's style, it was a completely blind bidding process. I was extremely gratified to see that my painting was an early favourite, and at my last check, 5 minutes before bidding closed, had secured a price more than double the cost of my complimentary gala ticket. I don't know in whose hands the painting left, but I would love to. 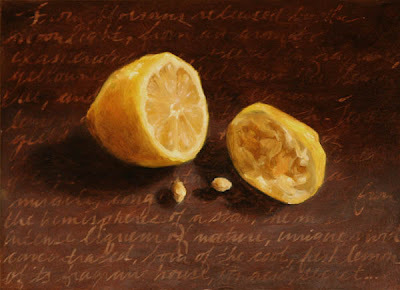 If you are the new owner of "Lemon, cut and squeezed", please do let me know. The auctioneer for the live auction of larger works was very entertaining, but I left before all the works had been presented to take a quick survey of the downstairs gallery of small works which will be sold at the public mystery art sale for the low price of $75 apiece beginning on Saturday. One of the OCAD attendants at the auction told me that public demand for the small works is usually so high that people begin to line up hours before the doors open. To see the online preview of the works on offer, click here. One of my paintings is still available in the public sale. But I can't reveal anything...yet. I'll post a picture once the sale is over. All proceeds from the Whodunit? art auctions and public sale go to support programs at OCAD. It's not too late to buy an original artwork and support a worthy cause. A day I’ve been anticipating with mixed feelings is almost here; the episode of STAR PORTRAITS in which I appear will air on Bravo! television tomorrow night, Saturday, Nov. 14, at 8:00 pm EST. The portrait I painted for the series will be posted to my completely redesigned website: parlour.ca shortly after the episode airs. I'd love to read your comments about the series or my revamped website. I attended the Royal Winter Fair yesterday. 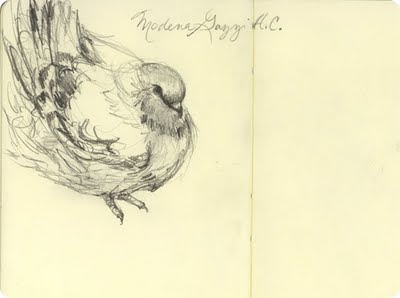 It was my first solo visit to the fair, and my first with sketchbook in hand. 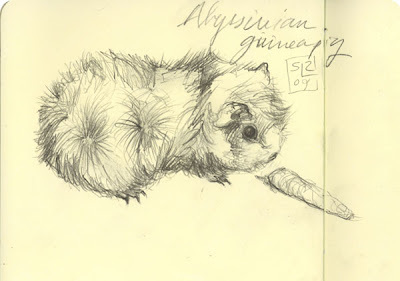 I had a fantastic day drawing and was surprized to see so many fellow sketchers. I spent a while talking to two of them: a young woman studying fine art at U of T, and a young man studying animation at Sheridan. 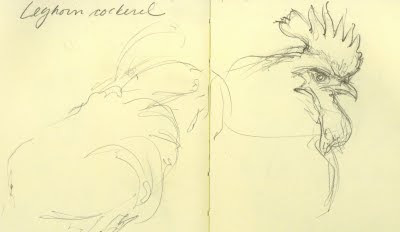 The fair is a fantastic place for drawing. 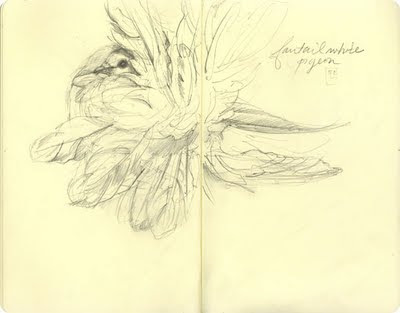 I'd love to try to make it back for one more day of sketching before it closes. 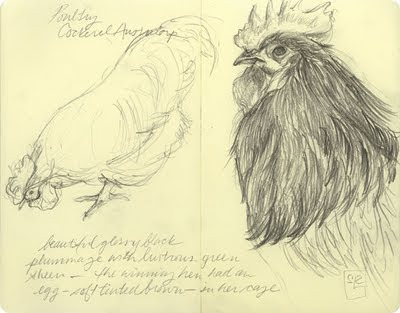 I'm posting a selection of drawings from my visit (mostly domestic fowl it turns out, and one g.p.). 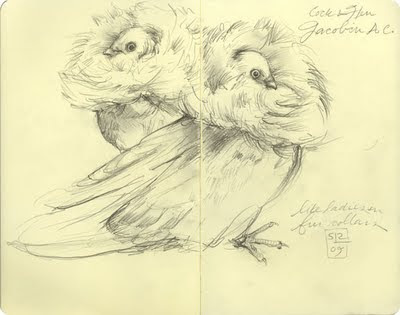 Elegant but slightly absurd Jacobin pigeons, like stylish ladies hiding behind high fur collars. 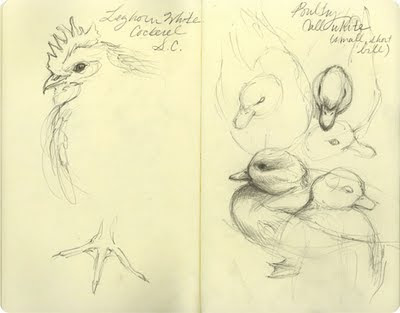 Leghorn cockerel and tiny, pretty Call ducks--pure white with small orange bills. A glossy black Australorp, with beautiful fluid lines and iridescent green sheen. 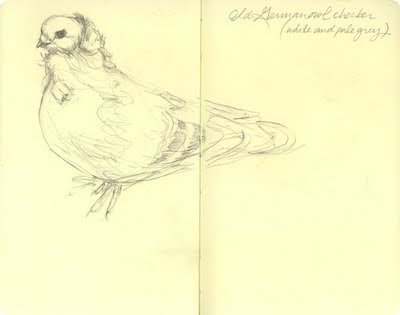 The prize-winning hen had laid a pale brown egg in her cage.